One of our favorite Twitter clients is so good that Twitter itself bought it in 2011. With real-time scrolling, advanced filtering options, and a host of useful features, TweetDeck is the obvious choice for anyone who wants to take Twitter seriously. Here's how to make sure you're getting the most out of it. If you've not yet given TweetDeck a go, we're here to guide you through its best features; for those of you who are already seasoned TweetDeck users, we hope some of the tips and tricks we've mentioned come in handy. For TweetDeck newbies, welcome! You're in for a treat. Sign into TweetDeck with your normal Twitter account and the first thing you'll notice is just how fast it moves. There's no need to refresh the page on TweetDeck, as new tweets—be they on your timeline or notifications page—appear automatically. You can untick the Stream Tweets in realtime option on the Settings screen (click the cog in the lower-left corner to find it) but this only slows down the stream into short bursts, rather than stopping updates altogether. If you've got a busy column or two, this raises the question of how you're supposed to read tweets properly or follow links before they vanish from view. The easiest way to temporarily put a hold on a column is to scroll down it slightly; the column then won't move until you return to the top. You can also click on any tweet to focus on it. Retweet, reply and favorite options appear when you hover over tweets, and you can click the 'more actions' button (three horizontal dots) to follow, mute, block and tweet at particular users. TweetDeck is geared up to work with multiple accounts too—from the Settings screen, choose Accounts then Add Twitter account to configure a new one. You can then monitor all of your accounts, including direct messages and notifications, from the same TweetDeck interface. Part of the beauty of TweetDeck lies in how much information you can have on screen at the same time. Click the plus icon on the left-hand toolbar to add a new column, which will auto-update just like the others. The list of column types you can add is impressive: you can view your timeline, your notifications, your mentions, activity around your account, your favorites, any of your lists, search results, direct messages, tweets from a single user, trending hashtags and more. You can in fact view the timeline for anyone on Twitter, from @gizmodo to @stephenfry—choose Home from the Choose column type screen, then enter the @name in the box at the top. This displays a column showing tweets from all the accounts your chosen user is following, so in the case of @stephenfry — who follows 51.5k accounts — you're going to see a lot of activity. You can do the same trick for @mentions, should you want to walk a mile in a celebrity's shoes, or see how often your local pizza restaurant is getting talked about. There are all kinds of custom columns you can create: searches for job listings, a hashtag you want to keep track of, mentions of your name (or your company's name) and so on. You can add any of your Twitter lists as a column too, so if your main timeline is too busy then one option is to replace it with a list of hand-picked accounts you want to focus in on. 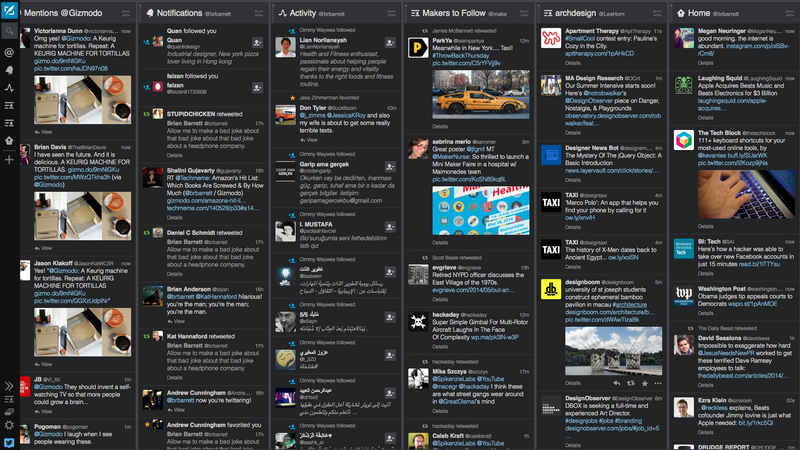 The deeper you dig into TweetDeck, the more there is to uncover. Click the configuration button at the top of any column (an icon showing two sliders) to tweak it further. The options here depend on the type of column you're dealing with, but you can typically exclude retweets, include or exclude specific words, and focus in on tweets that contain media or links. You can also limit the tweets that are shown to verified users or one specific user, while on the notifications column you can filter out certain notification types. The filters for searches are particularly powerful—you can tell TweetDeck to only return tweets that have a certain number of retweets, favorites or replies. There's an awful lot of noise on Twitter at times, and being able to sift through it is definitely an advantage. You can also switch on audio alerts, and switch off media previews for each of your columns. TweetDeck comes with an integrated mute option too, which you'll find on the aforementioned Settings screen (launched via the cog icon in the lower-left corner). You can mute text, users or sources across all of your TweetDeck columns, which is helpful if you want to avoid True Detective spoilers or dislike the political opinions of one particular Twitter user. TweetDeck has plenty of tricks up its sleeve when it comes to creating tweets too. You can post updates from any of your connected accounts (or multiple accounts simultaneously) via the big blue New Tweet button. The same interface lets you send direct messages too. Choose Schedule tweet to push out an update at some time in the future, then enter the date and time underneath. The tweet will be published whether or not you have TweetDeck open at the time. Your scheduled tweets can be viewed from a dedicated column of their own. Underneath each update you've queued up is the option to edit the tweet or remove it completely. Be careful when it comes to overdoing scheduled tweets; you don't necessarily want to be tweeting out the banal details of your life while some kind of national emergency is happening, but with a little bit of common sense they can be a useful tool to have. As elsewhere on TweetDeck, multiple accounts are supported for your scheduled tweets. You could stagger updates from the accounts that you manage, for example, or simply make sure that your followers aren't overwhelmed by a flurry of updates every time you catch up on your online reading. It's handy too for times when you're away from the computer but want to keep your Twitter stream active with fresh content. There are plenty of advanced features hidden away that will become apparent as you spend more time with TweetDeck. You can create lists from within the interface using the icon on the left-hand toolbar, for example, while previous searches you've run automatically appear whenever you click on the magnifying glass icon. At the bottom of every search you run is the option to add it as a permanent column. Click on any username to see a profile preview, complete with the account's current mentions, favorites and public lists. If you want to embed a tweet somewhere else on the Web, open up the more actions menu by the tweet and choose Embed this tweet. You'll see a preview together with the HTML code you need to copy and paste to make the embed work. Collections (originally called custom timelines) are a useful way of curating individual tweets, and they're unique to TweetDeck for the time being. Click the Collections icon in the bottom left (an icon showing a series of stacked cards) then choose Create collection. You can then drag tweets in from other columns, enter the URL of a tweet at the bottom or use the Add to collection link to build up your customized list. Collections can be based around topics, TV shows, events or whatever you like, and you can embed them elsewhere on the Web or generate a unique Twitter URL for them. Many of the same search tricks you can use on Twitter apply to TweetDeck. Use :) or :( at the end of a search query to look for positive or negative matches, or throw in the asterisk wildcard instead (e.g. "TweetDeck is *"). There are plenty of keyboard shortcuts to take advantage of too, which you can view by clicking the settings cog icon and choosing Keyboard shortcuts from the pop-up menu. As you can see, there's lots to explore within the TweetDeck interface, and the app's flexibility is what makes it so appealing. Let us know in the discussion below if you have TweetDeck tips, tricks or customized layouts that you want to share.